I hung this pic on my fridge in the kitchen. I rather like the placement. Steve doesn't. What do you think? It's an interesting image that I think belongs in the kitchen (where we, inconveniently, don't have walls) and because it's made from torn paper, I think you need to be able to view it up close and see the fibers to appreciate it. I'm not sure about the edges of the mat being so close to the three edges of the door - a little space around it would be nice. I would probably lower it six inches or so to balance with what's going on over on the left. But the subject matter + the fact that you want to look at it often should definitely be given more weight than perfect placement. Pretty colors and pretty fridge! 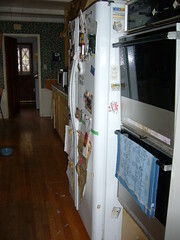 Posted: Sun Mar 02, 2008 3:42 am Post subject: your refrig. WOW, your refrig makes mine look like a dinosaur. The picture on to the dark color works. It's down. Steve didn't like it and, as sweetbabyjames said, the frame and mat are too large for the space defined by the wooden molding. I haven't given the idea up. I may look for smaller things. But .... but ..... but ..... where are the pizza vouchers from 7 local pizzerias, and the hundreds of useless fridge magnets, and the half a dozen calendars (most of them current), and the postcards, and at least 3 photos of someone's baby/children? Or is my fridge the only one covered in that stuff? Rainey...the timber colour reminds me of the top of a creme brulee...so perhaps a photo of a bowl of custard...ummmmmmmmmmm WHAT a fridge! Lol--over the years Rich has once or twice expressed an opinion about my decorating--but of course I shot him down. I agree that it's too big--maybe reframe it without mat? Nah--I just looked again, the squashes themselves are too large to be so close to your face as you open the fridge door. It seems like it should be in a bigger open area, but approachable (not over a sofa, etc.) so you can still walk up to it and see the art that made the Art. Judy- This is as much as I've got of a pic of the old one. Was that what you were looking for? Seriously, perhaps having lived with that sort of thing for ... oh the last 30 years we've had kids ... may be where the compulsion to have something on the fridge comes from. I have ONE magnet. It is kept in a drawer and used ONLY to secure a recipe to the fridge while I'm cooking. I have nothing against magnets, but I have seen how they breed! I'd pick something smaller - a bit smaller so as to give the image room to breathe as it were. Also put something with more in it. A small image of a landscape perhaps. The dark wood does seem a perfect background tho'. A posh fridge too... but naturally! LOL Rainey - now THAT'S a fridge! So you're telling me that in about 15 years time I can look forward to a clear expanse of fridge door - I'm looking forward to it! 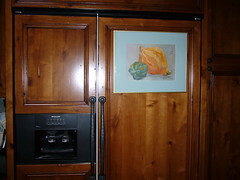 do fridge doors reflect personality? They must express personality! Mine is cluttered to invisibility & it's frequently an interactive experience as the pieces fall off or want to be straightened. I even find visitors rearranging my fridge. I love seeing pics of people's fridges/kitchens here. Much like artists who post pics of their studio spaces, no? Have to say I agree with GP though. In general, men don't need to help with decorating (present & clearly tasteful company excluded). Rainey, I can't see the detail but it almost looks like the mat could just be made a little smaller to fit...? Currently I only have 2 fridge magnets, a miniature schnauzer (now there's a surprise) and un cigale (Provencal cricket). I guess I could reframe — and, certainly, the size is the issue — but it's still a large and commanding image. But I haven't given up the idea. There may not be room in the kitchen for my lovely squashes after all. But I will be looking for miniatures that I can put on that large panel. The right thing(s) will show up in time.